Many people view the eggplant as some sort of exotic ingredient, but it’s actually quite easy to prepare and cook in a number of ways! 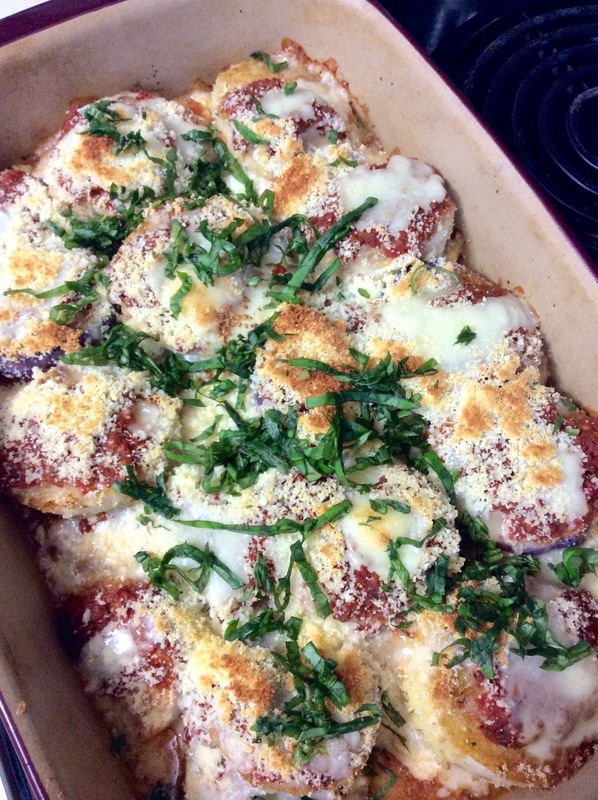 Eggplant parmesan is a wonderful way to start cooking with eggplant, and a great way to sneak in another vegetarian option to your menu at home. 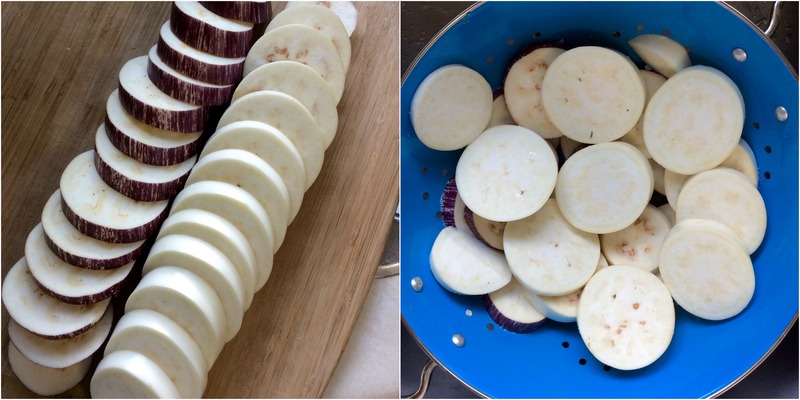 Before you do anything else, you need to slice your eggplants up; salt both sides of the slices and let them sit in a colander in the sink for at least 30 minutes. This will draw out extra moisture and bitterness. When you’re ready to get cooking, pat the slices dry on a piece of paper towel to remove excess salt. Sprinkle the breadcrumbs into a shallow dish; whisk the milk and eggs together in another dish. 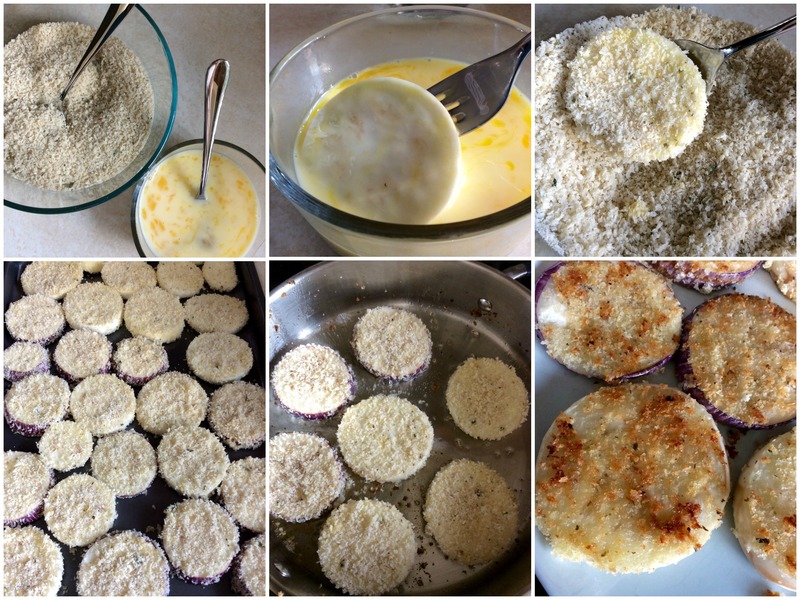 Taking the slices one at a time, dip the eggplant into the milk and egg mixture, coating both sides, and then dip it into the breadcrumbs. Shake off any excess. Set aside on a tray and repeat for all the slices. Heat a pan over medium high heat and add a generous dollop of oil. When it’s nice and hot, add one layer of eggplant slices to the pan, flipping part way to cook both sides. Remove the slices when they are golden brown and place on a paper towel lined plate. Repeat this step until all the eggplant has been cooked. Now it’s time to put everything together in a good sized casserole dish. Coat the bottom of the casserole dish with about 1 cup of tomato sauce. Add a layer of eggplant slices. Sprinkle a layer of mozzarella and parmesan on top. Repeat the layers until you run out of ingredients (about 3 layers). Make sure the top layer of cheese is generous! Cook for about 25 minutes in the oven. When it’s almost done, you may want to (carefully) switch to the broiler to brown the cheese. When the cheese is brown and bubbling to your approval, remove from the oven. Sprinkle the basil over top, and dig in! While frying the eggplant before adding it to the dish can take a bit of time – it is totally worth it! This dish is delicious right out of the oven and a great one to keep in the fridge for easy leftover meals. The moral of the story is -next time you’re at the Calgary Farmers’ Market, don’t be afraid to try something new!